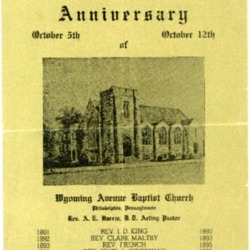 A schedule of events and services for the 50th Anniversary celebration of Wyoming Avenue Baptist Church, October, 1941. The cover of this bulletin is a glossy, gold-colored foil material. “50th Anniversary Golden Jubilee Schedule,” Wyoming Avenue Baptist Church Digital Archives, accessed April 18, 2019, https://omeka.wabcphilly.org/items/show/109.